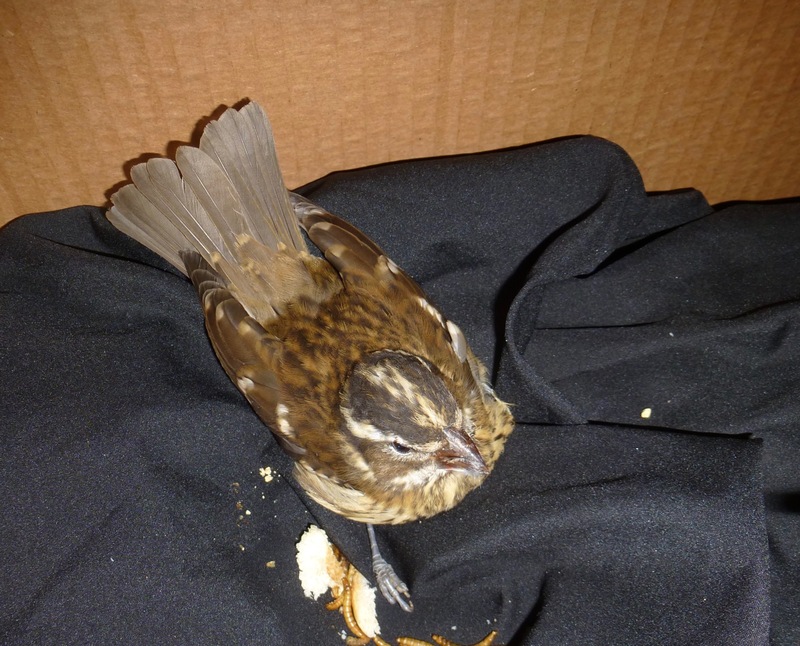 I am clearly not a birder: the debilitated “sparrow” I found this morning was not a sparrow, or at least that’s what I was told when the nice woman from Chicago Bird Collision Monitors came by my lab to pick it up. (She said they’d “had a busy day”, and also told me that she’s had tons of experience rehabbing birds.) It has yellow under its wings, and perhaps a reader can ID it from the photo below. It looks as if was perking up a bit, and it’s now on its way to the Willowbrook Wildlife Center for care. I hope they let me know how it fares. Good luck, birdie! Thanks to Michael Fisher for giving me the CBCM phone number. This entry was written by whyevolutionistrue and posted on September 29, 2018 at 11:25 am and filed under birds. Bookmark the permalink. Follow any comments here with the RSS feed for this post. Both comments and trackbacks are currently closed. I’m glad I have readers who know this stuff! We should send you on an ornithology course! But you do live in the urban jungle! Yes, definitely a female grossbeak, given the white midline through the crown and the streaked breast and sides. Could be a black-headed, I suppose, but the location indeed suggests rose-breasted. Yes, it somewhat resembles other species, but the heavy beak (with a sneer) gives it away. It’s the Brett Kavanaugh of the birds. Maybe it just needs a day or so to sober up? Is it a young Cooper’s Hawk? Just a wild guess, since there is a small family of Cooper’s Hawks on the quadrangles … with a nest near Harper Library, just to its north. Looks like a house finch. I could be wrong. Just an observation, but to identify it, the picture should get a side shot of its head and body and something for scale. It looks like a young Rose-breasted Grosbeak. I didn’t want to disturb it too much; otherwise I would have taken a better picture. Great news. Angry Catman’s work is never done. I always thought the mortar bird was what left duck prints in the wet cement. Hey, Michael deserved a good groan, too! Rick has the cute black dog avatar while I’m stuck with my face [tinted blue – not natural]. It’s favouritism I tell yah. PS: Is there a story behind the blue face? I thought, maybe, from your last name. It’s a White-throated Sparrow… very common migrant right now. Grosbeaks are long gone from the NE now! But, look at it’s gross beak! Not sparrow like at all. If Grosbeaks have flown the coop, this one is a straggler. eBird bar charts for Cook County show the Rose-breasted Grosbeak peaking in mid-September and disappearing in mid-November. climate change influence over your past experience? Rose-breasted Grosbeak, most likely a female, possibly a first year male. Black-headed Grosbeak wouldn’t have all the streaks on the breast (with other differences in plumage) and their normal range at Chicago’s latitude is west of central Nebraska, whereas the Rose-breasted’s range runs from Nova Scotia to eastern Nebraska. They like to eat fruit and invertebrates. The males are lovely, especially in the spring, and have a nice song. Perhaps someone should take it to Cuba! A birder friend says if it’s the size of a Robin, it”‘s probably a female or juvenile Rose-breasted Grosbeak. If it’s the size of a sparrow, then it’s likely a female Purple Finch. Friend remarks it,s hard to tell from angle of shot and nothing against which to reference the bird’s size.